Benjamin Mincey, after Edmund Poole, was the second “chief” of Wilson’s African-American volunteer fire department, the Red Hot Hose Company. This magnificent photograph depicts Mincey in full fireman dress regalia. In the 1900 census of Wilson town, Wilson township, Wilson County: farmer Prince Mensey, 60; wife Susan, 52; children Ben, 19, Emma, 19, and Oscar, 12; and niece Rosetta Mensey, 7. Ben Mincey, 21, of Wilson, son of P. Mincey, and Mattie Barnes, 20, of Wilson, daughter of M. and Mariah Barnes, were married on 12 January 1904. Berry Williams applied for the license, and Baptist minister Fred M. Davis performed the ceremony in his home in the presence of Harry Mercer, W. Aken, and E.M. Davis. In 1918, Ben Mincey registered for the World War I draft in Wilson. Per his registration card, he was born 25 December 1879; resided at 411 Wiggins Street; worked as a laborer for the city of Wilson; and his nearest relative was Mattie Mincey. In the 1920 census of Wilson, Wilson County: at 411 Wiggins Street, city pipe fitter Benj. Mency, 38; wife Mattie, 37, tobacco factory worker; and children Benjamin J., 11, Mildred, 7, Maddison, 5, and John, 3 months. 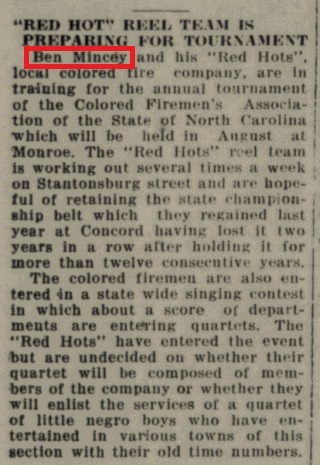 Wilson Daily Times, 26 June 1929. In the 1930 census of Wilson, Wilson County: at 656 Wiggins Street, valued at $800, town of Wilson plumber Benjamin Mincy, 48; wife Mattie, 49; and children Benjamin Jr., 23, Briggs hotel cook; Madison B., 16; Mildred, 17; and John H., 11; and roomer Andrew P. Sugg, 59. In the 1940 census of Wilson, Wilson County: City of Wilson plumber Benjamine Mincy, 60; wife Mattie, 60; and sons Benjamine, 31, hotel cook, and Johnnie, 21, daily paper deliveryman; and granddaughter Deloris Woodard, 5. Benjamin Mincey died 14 July 1950 at his home at 712 Wiggins Street, Wilson. Per his death certificate, he was 67 years old; was married; worked as a plumber for the town of Wilson; was born in Greene County to Prince Mincey and Susan Suggs; and was buried in Rountree cemetery. Informant was Mattie Mincey. Photograph of Mincey reprinted from Wilson Daily Times, 29 April 1999. Many thanks to Pamela Mincey Myers, who advises that the original of this portrait of her great-grandfather hung in the living room of her grandparents, Benjamin Madison Mincey and Lala Rook Barnes Mincey at 723 Lincoln Street, Wilson.